If this is to be the final full-length chapter from this Irish band, they’ve given their parting salute with an impeccable album. “I started a fire, I watched it grow, and now it burns out of control”. What a perfect start to an album that is. Ireland’s Ash have always provided the jaunty, ear-grabbing soundtrack to find your significant other, ever since their first disc Trailer was unleashed upon the world in 1994, when they were just 17 years of age. Their allure lies not only in the charm of their hearty, romantic lyrics, but in the unpredictable way the melodies are shaped, the words written. The couplet above is followed by “I leapt off a precipice, and I’m falling into an abyss”; on their fifth full-length, the group are playing as a three-piece for the first time since their sophomore 1977, having lost Charlotte Hatherley to a solo career. Obviously, they’re no longer feeling the ‘limitations’ of being a trio they were back then: energy is embedded into every spare second of Twilight of the Innocents, and not just thumping lead single “You Can’t Have It All” (wise words indeed). A bash abounds in garage-rock distortions, “woah-ohs” and a raunchy Strokes bassline that re-emerges later in the disc on “Dark & Stormy”, which despite its downcast title is a strutting of glammed-up guitar and amplified rhythms. If Mark Hamilton’s output adds a rumbling four-stringed exuberance into the mix, Rick McMurray’s cymbal-ridden percussion adds fuel to the groove, and Tim Wheeler occupies his fingers with guitarwork one moment blistering, the next subdued, while his solos are both melodic and distinguished. The most important connection, though, to the record is made through Wheeler’s breathless delivery; although he and his band have truly matured and gel better in three-piece form than ever before, it’s his personality that makes him still rub off like a teenager… and, in a way, that’s what makes Twilights of the Innocents convincing. It’s easy, in that case, to list the slamming bass notes on a piano during “I Started A Fire”, matched with double-edged guitars a la Foo Fighters, or the way “Palace of Excess” slips a falsetto chorus that smoothly ascends in semitones with ambient electronic flourishes throughout. But that would be understating the atmosphere, the subtle blend of it all, the overall effect which has to be heard to be fully appreciated. On the other hand, you couldn’t miss the album’s irresistible, soaring poppy stanzas that have Beatles written all over them (or not – “we’re way better than the Beatles”, Ash so modestly claim). So that you’re included as much as Ash are on the disc’s ride, they push all the right buttons for the sake of a rock-out chorus, and they have a way of peering at social ills on select tracks with a wink and a nudge. “Blacklisted” goes from its opening line “Blacklisted in this town” to descriptions of raining fire and brimstone and collapsing galaxies, as if they’re suggesting that they’re blacklisted because they’re singing about such themes and still seem as unfailingly jovial and uplifting as anything. The fact that the lyrics could also be interpreted to address a lost lover adds to the mystery of it all. Yet “End of the World” follows the same path and is as musically stark as the band gets; instead of promising impending destruction and ruin, Ash bring forward the apocalypse by painting it, on a balanced acoustic accompaniment, as everyday living, losing none of the offhand insight that could otherwise make it, whisper it quietly, a tad embarrassing to listen to. Free of hellish, overblown proclamations of doom, Wheeler wanders his way through a set of musings that hit home – pondering whether feeling low is the latest fashion, breathing the motorway for the sake of breathing, wondering if anyone would really notice if he died, or if he’s dead already – but keeps coming back to the question, “Is this the end of the world?” which infused with a marked sense of helplessness becomes a memorable hook. Hats off if you can name another band that can do that in a song about the extinction of man. All six minutes of the title track wraps up Twilight of the Innocents, replacing the guitars with resonating, shimmering strings and an innocent, free-flowing pace. The bass piano notes return, this time snaking ominously through the second verse, and marching-band snares rattle into the cut’s final moments, brought home by Wheeler’s heartfelt repetition of “I’m still breathing / My heart’s still beating” that sums up the whole album’s sun-setting, yearning intensity in a nutshell. 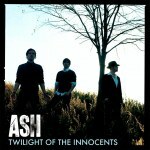 It has been announced that Twilight of the Innocents will be Ash’s final studio album, that from now on the three will devote their efforts towards digital singles for a digital world. It’s possible the band don’t believe in the value of writing and recording a full-length record anymore; but they have to bear in mind at the same time that this is a seamless work that, at times, flirts with perfection, and if they do decide to leave the album format behind from here, they’ve given their parting salute in a most impeccable manner.